Three Tree and Redondo: Where Have All the Critters Gone? Dave W., Brian H., and Pieter B. met at Three Tree at 8:30 on this sunny, but cold morning. Tide was high on about an 8 ft. exchange, but Three Tree is known for its mild currents so there were no worries. We did our standard dive starting at the small tire pile, then the golf ball boat (no octo. ), then on to "pipe gardens", "culvert city", then back along the 30 fsw contour. Brian and Dave spotted the juvenile wolfie in the keg at about 80 fsw. 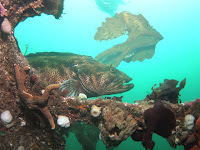 but in general very few rockfish, no octos., and only a couple ratfish and no nudibranchs. Viz. was 20 feet and water temp was 46-48. For the second dive, Brian decided to split wood and Pieter and Dave headed to Redondo in hopes of encountering more fertile grounds. At Redondo, we did our standard dive ending up in the eelgrass....except there is no eelgrass (I presume, all wiped out in the windstorm). No octo under the deep boat, no octo under the observation pipe, but yes octo under the shallow boat by the pipe. I did see the small decorated warbonnet in its lair in the observation pipe and saw that it was on eggs..apparently very recently laid. However, even the abundant gunnels were a rare sight today. Maybe shallow temps have dropped too far and many critters are heading deeper?